I hope you don’t mind, but I wanted to show you my new homemade underwear. 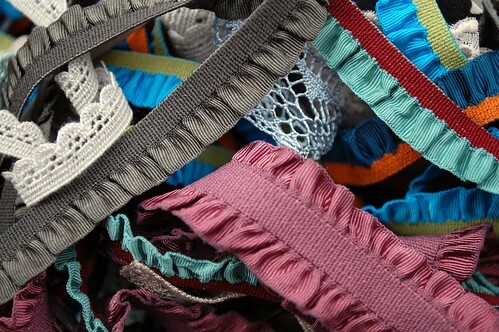 I have been collecting pretty elastic trims from Mokuba in anticipation of creating a new collection of cute undies for myself. These two pairs were made using the same patterns we use in the Underwear class. They are the most comfortable underwear I own. Not only because the fit is amazing but because this organic knit bamboo is so soft and lovely. Making these two pairs hardly depleted my trim stash, so next up I want to knock off some undies I already own and create my own patterns. Next Monday I hope to schedule in a whole day just devoted to this project. Amy of Angry Chicken is all about making her own underwear too, so I’m not the only one! These are seriously so gorgeous!!! And your trim collection is to die for! love the color combo and that trim is really pretty. i’d like to try making my own someday. Oh my gosh! I hate shelling out 10 bucks for a pair of underwear made with cheap fabric, so these look really tempting. I love those bamboo knits and I even have some in my stash. that is too funny, I was just mentioning to someone yesterday that I wanted to try making my own undies from bamboo! 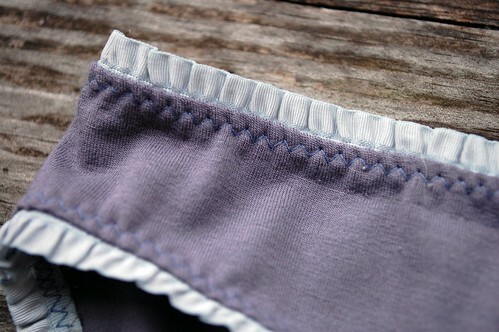 They are super cute and I love the trim. Now I just need to find a place in Vancouver with lovely trim. Hmmm….any suggestions out there? Very sassy! I think I would benefit a whole lot from taking this class. I’m very low on undies these days. how great! I’ve been following angry chicken’s undies too. I have bamboo socks and they are very silky, soft. Your collection of trims is making me drool – so pretty. Yes, add this to the list of classes I *need* to take. I really like the pattern that you’re using because there’s no crotch seam! Awesome! I don’t even need the fancy ruffles. Where do you purchase bamboo knits in Toronto? Those look awesome! I wish I was close enough to take a class….